Little Botanical / A Day In The Life Of / A day in the life of…..
What time does your alarm wake you? 6am, then 7, then 7:30… I’m terrible at waking up on the first alarm! As long as I’m up by 7:30am I am good to go. As soon as you arrive in the office you….? Head straight to the coffee machine! I can’t physically function before my first cup of coffee. I’m responsible for the marketing at Montezuma’s. This includes running all of our social media, planning product launches, organising collaborations and running competitions. Getting to try all of the chocolate for marketing purposes, obviously! I love collaborating with other brands and making sure everyone knows how wonderful our chocolate is (which isn’t difficult to be honest). Do you have a favourite product from The Little Botanical? I can only choose one?! I really love my Monstera, it lives very happily in my bathroom and always gets compliments from guests. Christmas is coming, tell us what you hope Santa brings you this year? Since buying my own house, all my gift lists are home related! I’d love some more TLB plants (I already have about 7 of them); I’d love a Scindapsus and an Echeveria Hookeri! 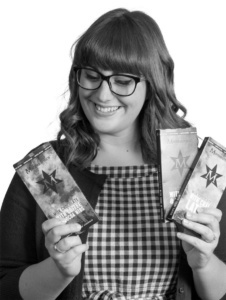 I might also gift myself some Montezuma’s American Idol Truffles, because they are to die for! Also anything from Cath Kidston. Thanks to Jasmine and please head over to our Instagram to enter our competition!